U.S.—The Associated Press paid a touching tribute to recently deceased president George H.W. 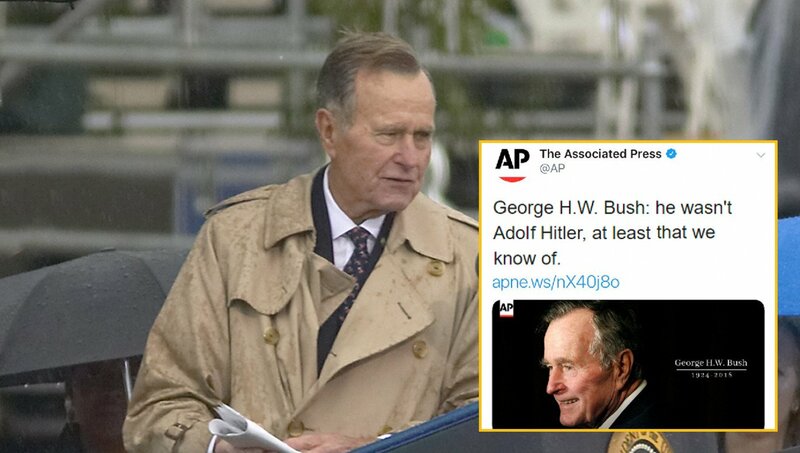 Bush in a headline published over the weekend, boldly declaring that the former commander in chief probably wasn’t Adolf Hitler. Certainly dead Republicans are more useful than out-of-office Republicans, who in turn are more useful than in-office Republicans. Some of whom, nevertheless, remain useful. Kurt Schlichter’s take is worth reading, if only to remind us that the Babylon Bee is cutting awfully close to the mark here. I’m old enough to remember when the lying media [redundant] were all-in, 24/7 in the “lie about GHW Bush” mode (what else do they have?). That being said, I confess I could not forgive the otherwise great man for November 1992 – losing to Slick Willie and Hillary. Verily, the only good liberal I ever saw was dead. Ross Perot bears most of the blame for Slick Willie. The opinion research data I’ve seen indicates he drew about equally off each candidate. The 1992 election was certainly odd. 1. You have an amazing collapse in Bush’s public esteem over a period of about 17 months the antecedent to which was nothing much. (A mild recession that lasted 8 months and was over in April 1991). 2. Partisan Democrats use the term ‘draft dodger’ to refer to any Republican who didn’t enlist in the military. Bilge Clinton wasn’t someone who took advantage of a statutory deferment available to a seven or eight digit population of youth. He successfully executed a series of maneuvers which allowed him to shirk his ROTC service obligations. An Army officer he’d hoodwinked was so incensed he saved the last smarmy letter he’d gotten from Clinton in 1969 and published it in 1992. The effect of this on Clinton’s standing was approximately zero. (You’ll recall what a to do the media had made of Dan Quayle having enlisted in the National Guard in 1969, while never calling attention to Michael Dukakis having had a student deferment throughout the Korean War). 3. My own impression of the media (and I wasn’t a Republican voter at that point) was that they were an extension of the DNC press office, relentlessly hyping mild labor market problems. Some of Albert Gore’s public discourse was bizarre, such as comparing the economy to a child run over by a car. 4. Lawrence Walsh ended his career as special prosecutor squalidly, securing an indictment of Caspar Weinberger for perjury due to a discrepancy between some oral testimony he’d given on a meeting and the notes he’d made of that meeting 15 months prior to his oral testimony. The discrepancy wasn’t on a matter of much interest and Weinberger had voluntarily offered up the notes. The indictment itself was also invalid due to the passage of time and secured just days before the election. A Democratic vote in my family reacted thus, “What?? I can’t remember what I said to someone last week”. That indictment of Weinberger Art was thrown out by a Federal Judge on December 11, 1992. Walsh and his minions knew it was garbage and were simply playing politics, which is completely beneath contempt.